Open daily noon-4, June-July-August. Weekends, September-October. 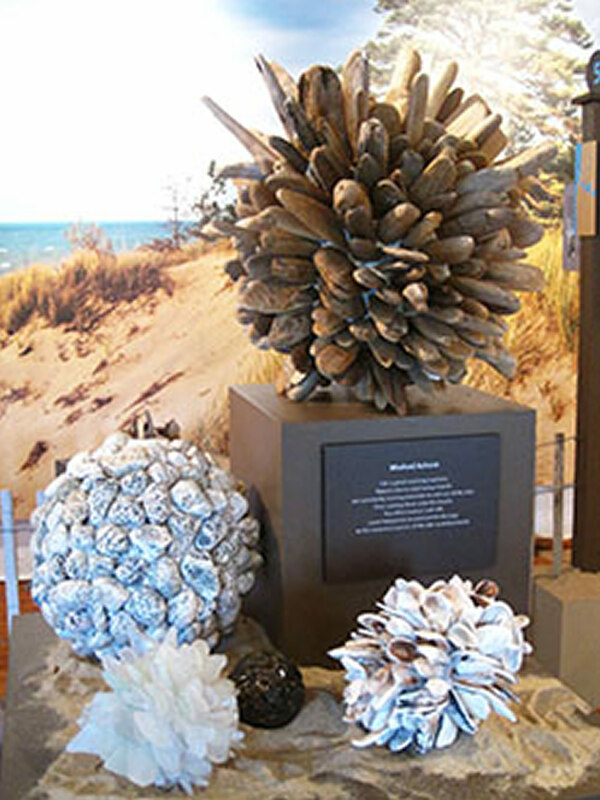 This year's exhibition at the Saugatuck-Douglas Historical Society Museum builds upon its first-year's celebration of the Saugatuck area dunelands with the addition of a new drone's-eye video offering unusual lakefront perspectives, plus a new outdoor art display dramatizing the value of keeping the shoreline free of long-lasting trash materials. 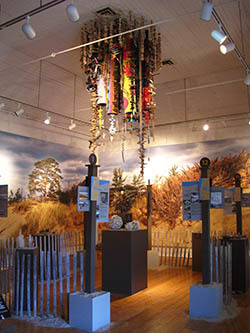 The Museum occupies the historic Saugatuck Pumphouse at 735 Park Street, in a scenic garden setting along the west shore of the Kalamazoo River at Mt. Baldhead Park, a short walk north from the Saugatuck Chain Ferry landing. Open daily through August, Noon to 4pm, its admission and nearby parking are free. 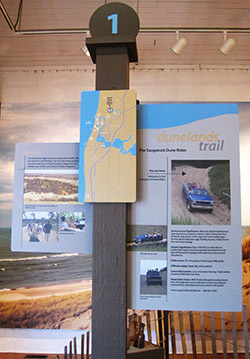 "Dunelands-2" focuses on our piece of the world's largest freshwater dunes system, highlighting its archeological, historical, environmental, social and recreational significance. A major new attraction added in the Museum's main gallery presents a large-screen aerial video captured by a small, camera- equipped drone. The remote-controlled craft was flown over the Saugatuck/Douglas lakefront recording multi-seasonal views to identify and document human structures, historic sites, harbors both old and new, Ox-Bow, high water, ice formation, dune trails and other lake/land/river features, some familiar, some not. This unusual video was produced for SDHS by Jeff Zita, student at Holland's Hope College, whose drone-recording hobby has netted appearances on national television. A new outdoor exhibit adds eight "learning stations" placed throughout the Museum's riverfront garden, each bearing an informative plaque intended to entertain and educate visitors about a specific type of common beach trash and its long-term effect on the environment. Each station is topped with a ceramic sculpture produced by Saugatuck High School students of art teacher Christa Wise, presenting their artistic interpretation of the trash material highlighted. 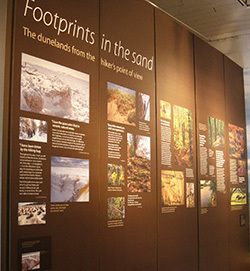 "Our duneland is a marvelous collaboration of restless beaches, rolling forests and ravines, hidden streams, ponds and marshland habitats", says Museum Curator Dr. James Schmiechen. "This exhibition tells of how they came to be, how human activity has changed them and how people have changed in response to them, while giving special attention to historic sites scattered across the area and how history has set the stage for today's vibrant local community." Hovering above it all is "Beachcomber's Folly" a whimsical-while-thought-provoking hanging sculpture by Saugatuck artist Ted Reyda. 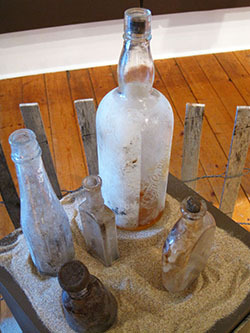 The colorful composition was meticulously assembled from thousands of items that were washed up on local beaches and collected by Reyda over more than 20 years. Below, Reyda transforms other types of manmade flotsam into spherical standing artworks. In their own playful way, all serve to raise serious questions about human carelessness regarding our environment and disregard for protecting nature's gifts. Museum guests will find themselves silently drawn to interact with Reyda's art by identifying its components...sometimes obvious, sometimes not. Continuing the Society's tradition of offering books created to accompany exhibits past and present, the Museum's south gallery gift shop again features two of its most popular award winners -- The Village Table: A Delicious History of Food in the Saugatuck-Douglas Area; and Off The Record...the unpublished photographs of Bill Simmons. The Village Table, authored by Society volunteers Kit Lane and Stacy Honson with graphic design by Sally Winthers, won a 2012 Leadership In History Award of Merit from the American Association for State and Local History (AASLH). It celebrates the Saugatuck-Douglas area by exploring its food: what the settlers found, what was fished, what was gathered and grown, what each wave of newcomers brought, what the restaurants served to visitors, and what we eat today. Each chapter focuses on a different aspect of the food scene and concludes with a selection of menus and recipes that favor locally-available ingredients. Off The Record, written by James Schmiechen with help from Society volunteers Kit Lane and Jack Sheridan, and designed by Ken Carls, received a Historical Society of Michigan Award of Merit in 2001. It offers a fascinating pictorial history of Saugatuck in the'40s and '50s seen through the eyes and camera of an insatiable photographer whose skills ran the gamut from art photography to photojournalism. Simmons (1891-1966), worked for The Chicago Evening Post and Time-Life, Inc., later was editor of Saugatuck weekly The Commercial Record for 10 years in mid-century. He left a collection of some 3000 unpublished photos, mostly negatives, shot in and around Saugatuck from 1941 to 1961. 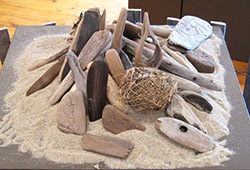 The map offers Museum visitors an engaging way to soak up the story of the Saugatuck-Douglas area. As many as 70 map-highlighted references are keyed by number to let visitors select and learn about sites of interest by calling up information, narratives and images using several video/interactive touch- screen terminals near the map. The screens also offer topical "interactive programs" such as History of Hotels/Boarding Houses; History of Boatbuilding and Boat Builders; Buildings and Architecture; Artists and Painting; Local Biographies; History of Saugatuck-Douglas Schools; 13 Tales of the Villages and A Video History of Saugatuck and Douglas. In addition, the terminals allow public access to the Historical Society's digitized archives of historical photos, pages of The Commercial Record dating back to 1868, the Saugatuck-Douglas Building Survey and more. Founded in 1992, the Saugatuck-Douglas Historical Society Pumphouse Museum is open daily Noon to 4pm from May 29 through August, then Saturdays/Sundays in September and October. Admission and parking are free. Tel: (269) 857-7900.